MainAll NewsMiddle EastKhamenei: We must cooperate with Russia to isolate U.S.
Khamenei: We must cooperate with Russia to isolate U.S.
Iranian Supreme Leader tells visiting Russian President that Tehran and Moscow must step up cooperation to isolate the United States. 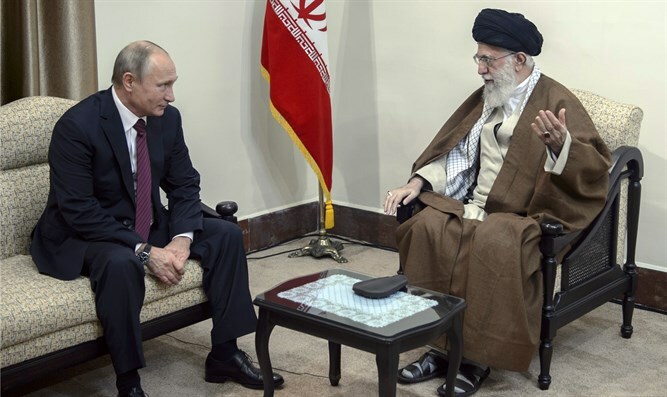 Iranian Supreme Leader Ayatollah Ali Khamenei on Wednesday told visiting Russian President Vladimir Putin that Tehran and Moscow must step up cooperation to “isolate the United States” and help stabilize the Middle East, Reuters reported. Putin met Iranian political leaders in an effort to nurture a warming relationship strengthened since U.S. President Donald Trump threatened recently to abandon the international nuclear deal with Iran reached in 2015. “Our cooperation can isolate America ... The failure of U.S.-backed terrorists in Syria cannot be denied but Americans continue their plots,” Khamenei was quoted as having told Putin. Iranian President Hassan Rouhani echoed Khamenei, saying Iran and Russia together could tackle “regional terrorism” - an allusion to Sunni Muslim armed groups hostile to Iran, Syrian President Bashar Al-Assad and many other Arab states. “Our cooperation has helped the fight against terrorism in the region ... Together we can establish regional peace and security,” Rouhani was quoted as having said in a televised joint press conference with Putin and Azerbaijan President Ilham Aliyev, who took part in a three-way summit in Tehran. Iran and Russia have grown closer through their mutual support of Assad in the Syrian civil war. Iranian leadership, particularly Khamenei, regularly criticize the U.S. and have upped their rhetoric in recent weeks, since Trump refused to recertify Iran's compliance with the 2015 nuclear deal. Khamenei consistently verbally attacks the United States, to which he refers as the “Great Satan”. He has insisted his country won’t negotiate with the United States and must stand strong against Washington on the region’s conflicts. Just last week, the Iranian Supreme Leader claimed that the United States created the Islamic State (ISIS) jihadist group. Russia has criticized Trump’s disavowal of the nuclear agreement, which has opened a 60-day window for the U.S. Congress to act to reimpose economic sanctions on Iran.